Postcard US-3223053 to Switzerland shows a satellite image of Lake Okeechobee in Florida, the second largest freshwater lake contained entirely within the contiguous 48 states in the U.S. Lake Michigan is the largest. For the largest lakes of the all 50 U.S. States by area including freshwater and saltwater lakes, if the area accounted for the lake includes the area partially in Canada or Mexico, Lake Superior is the largest while Lake Okeechobee ranks tenth. 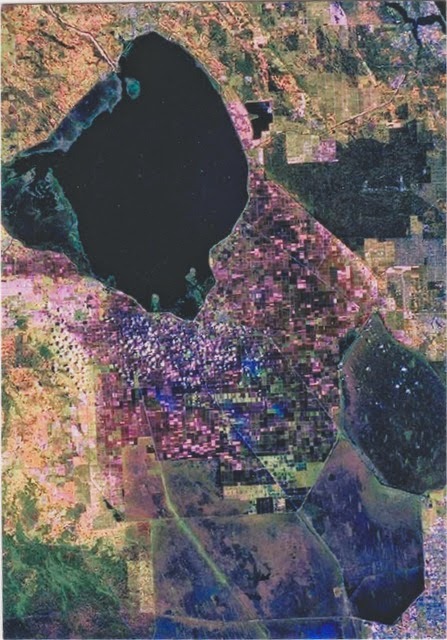 Okeechobee covers 1,900 square kilometers or 730 sq miles, with an average depth of 3 meters or 9 feet. It is the headwaters of the Everglades wetland ecosystem.